WNBA fans unite, you can now hold court in your living room with a new video game featuring lady ballers. For the first time in its' 21-year history, WNBA teams and players will make their debut in Electronic Arts Sports’ NBA Live video game series. The game features the current roster of players in the 12-team league, although some had hoped to see legends such as Lisa Leslie, Dawn Staley, and Sheryl Swoopes in the game. WNBA President Lisa Borders said she is delighted to make history with the franchise. “With EA’s expertise and ingenuity, the game will provide a terrific platform to showcase the players and the league, enabling fans to experience the WNBA in a new, exciting way,” Borders said in a statement. Since it was created in 1990s, NBA Live has allowed fans to enjoy players and teams of the corresponding year, including top players from the ‘50s through the ‘90s in the NBA Live Legend All-Stars Team. NBA Live executive producer Sean O’Brien said the franchise has been working to integrate the WNBA into the game. “This is only a taste of what we have in store, and look forward to working with the league on more great integrations in the franchise in the future,” O’Brien said. While old stereotypes suggest that women are not gamers, research shows otherwise. According to a report by the Entertainment Software Association, 41 percent of gamers in the U.S. are women. It also found adult women make up a greater portion of the video game-playing population than boys under the age of 18. Tia Haas, a 29 year-old from Philadelphia who calls herself a “grown woman who plays games,” has been a gamer since she was six years old. To connect with other black female gamers, she joined Black Girl Gamers, an online community for black girls passionate about games. A fan of the NBA Live video games and the WNBA, she said the female teams inclusion in the game is long overdue. Having played a demo of the game, she noted that the graphics could be improved and that women’s jerseys looked too tight. 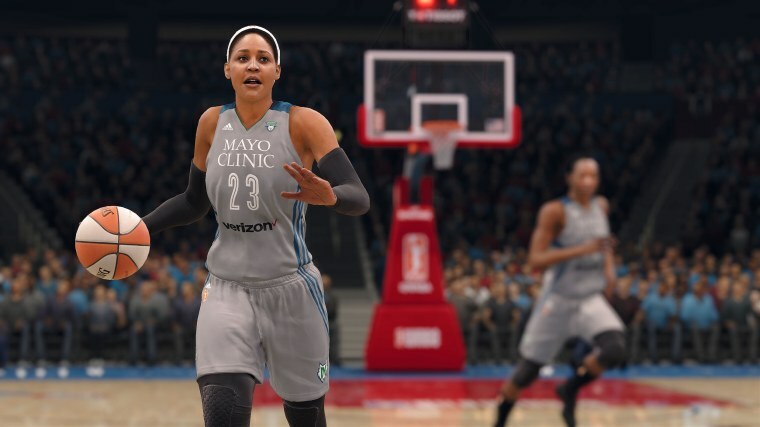 Haas pre-ordered the game and looks forward to playing her favorites including Candace Parker of the Los Angeles Sparks, Maya Moore of the Minnesota Lynx, and Brittney Griner of the Phoenix Mercury on Xbox One. She hopes adding the WNBA to the game will inspire people to get to know her team even more. The WNBA star also said it’s another way to “role-model” for young black girl gamers. “It’s obviously not a real person they’re engaging on the screen there, but it’s the image of us and the image of a black woman being successful and athletic and fun and energetic — doing something well,” Moore said. NBA Live 18 is officially available Tuesday, Sept. 19.